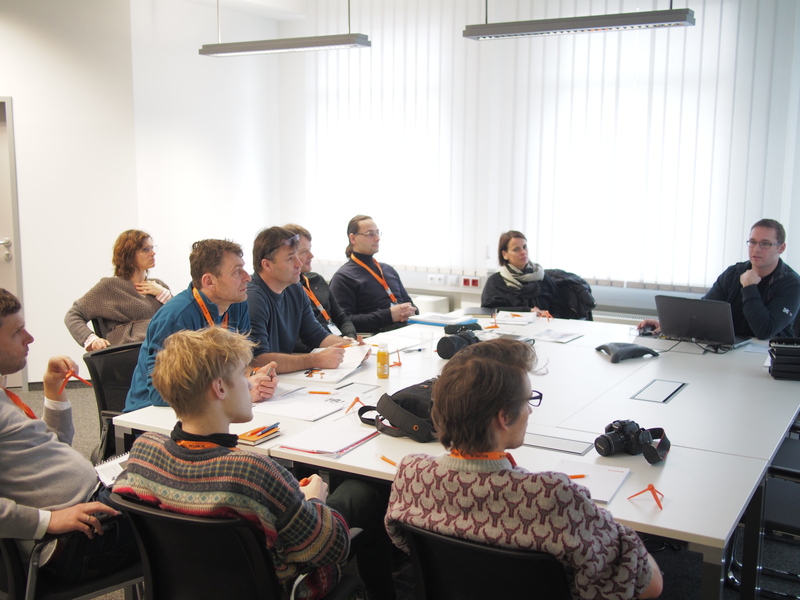 The safety regulations mentioned in the previous post are sufficiently complex that we decided to call the professionals, in our case Pilz. 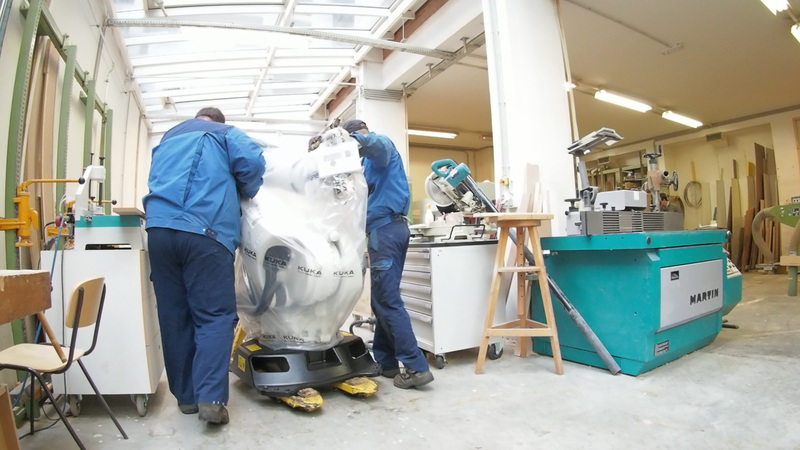 They’re market leaders in safety equipment and are now installing everything that is required to make a robot safe to use. Starting with a safety fence that is equipped with “bullet-proof” 8mm thick polycarbonate (less to protect “against” the robot, but rather to keep damaged rotating tools and chipped material within the cell), sensors that detect when a door is closed and when it’s open, and electronic locks to keep users out when the robot is operating in Auto mode. 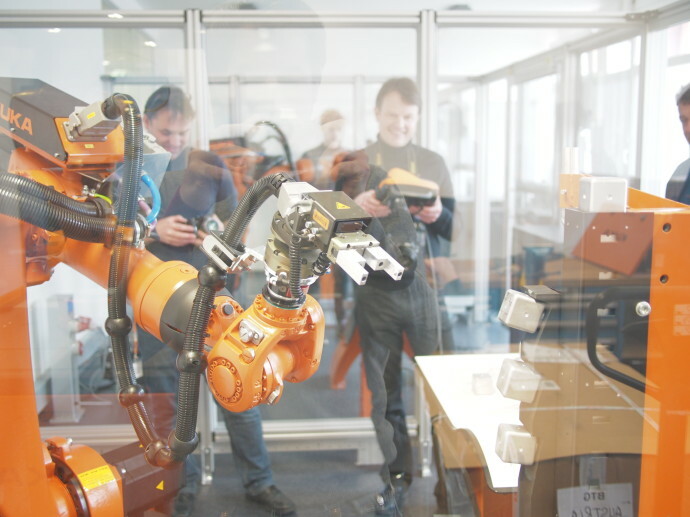 All of this is wired to a safety-PLC which is actually housed within the KUKA robot cabinet. 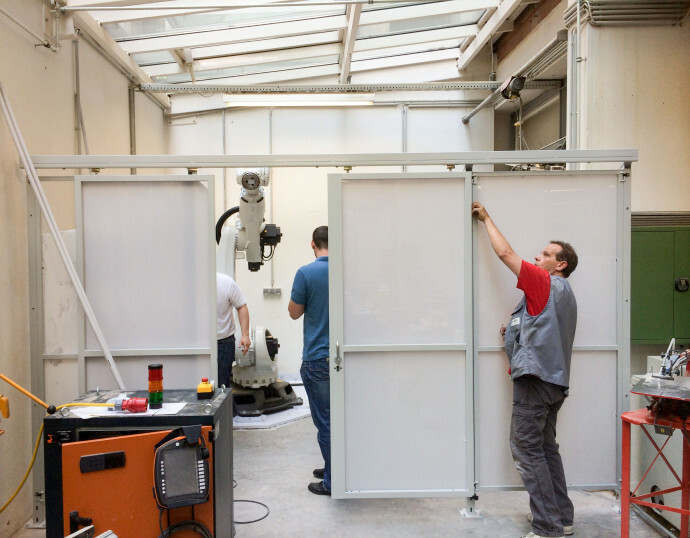 Behind the fence are Christoph Ryll, David Machanek, and Mr. Paradeis of Pilz who developed and implemented our robot-safety concept. What a beautiful, white robot! However it required an additional steel-plate to ensure that it’s mounted safely for many years to come. 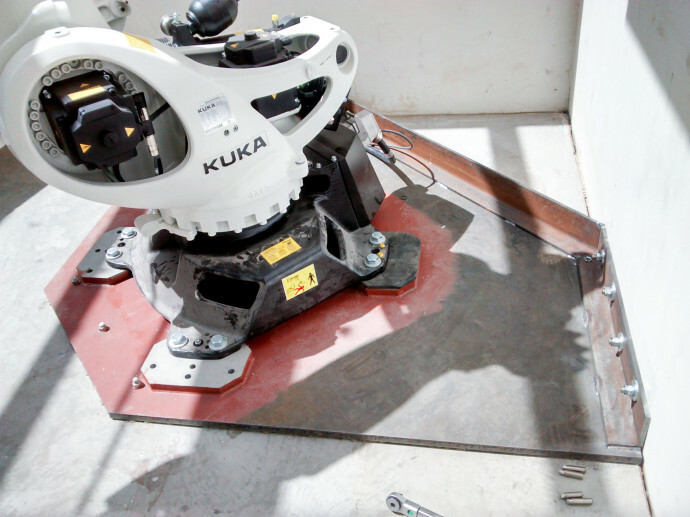 The KR120 is already moving, but not yet in a “legal” way, as safety regulations require a number of preventive measures to protect the robot users. Permalink to KUKA KR120 has arrived! 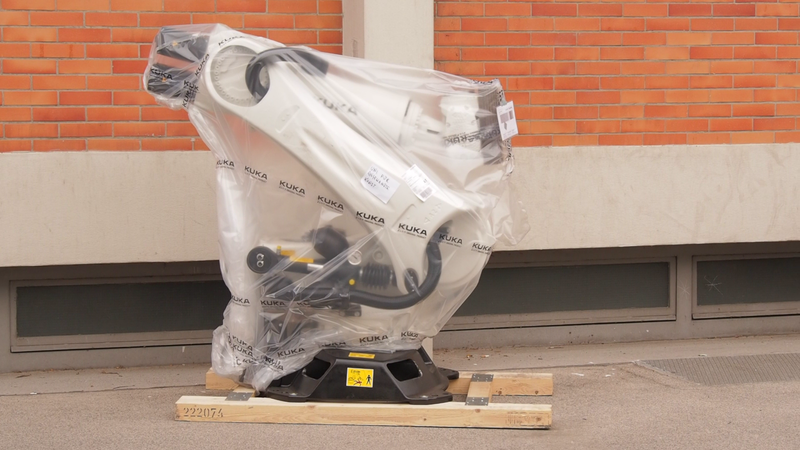 We’ve just taken delivery of a brand new KUKA KR120 R2500 Quantec robot of the newest generation at the Wood Technology workshop of the University of Applied Arts Vienna. 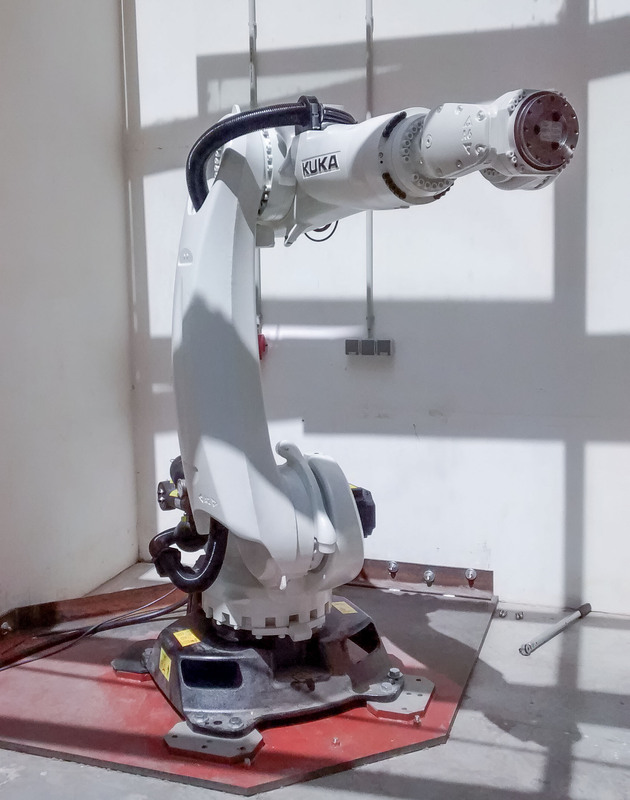 Within the next few months, the robot will be set up in the workshop and coupled with high-end safety equipment by Pilz to ensure safe operation. 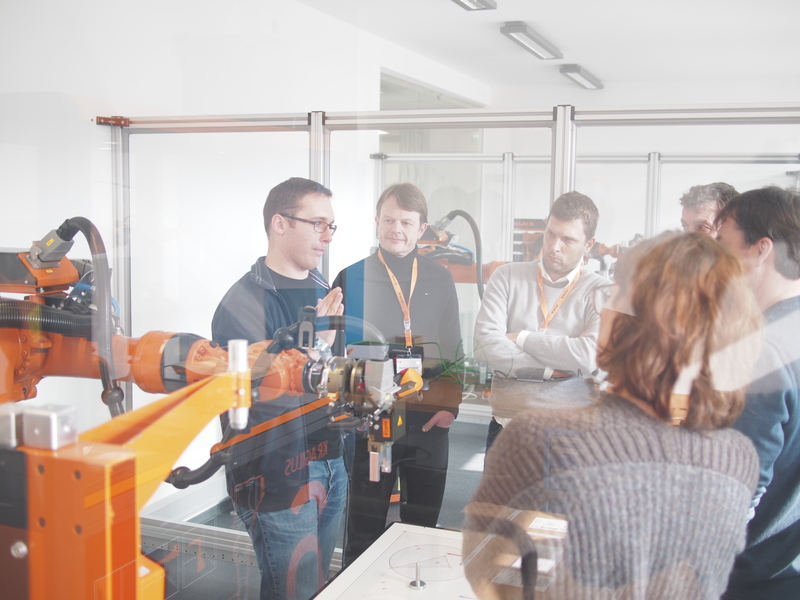 The research team of the Robotic Woodcraft project successfully completed the basic robot training that was provided by KUKA at their Austrian office in Linz. 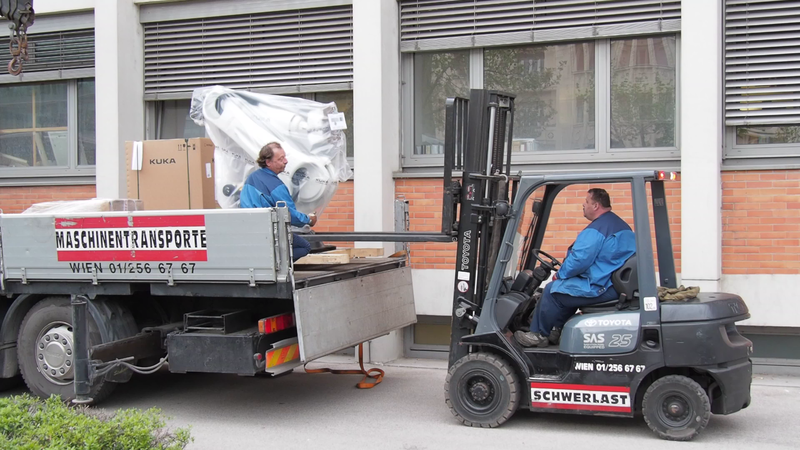 We’re thrilled to have the robot arrive soon at the Angewandte!